The Role of Sulfur Dioxide Aerosols in Climate Change | Watts Up With That? In 2007, the Nobel Prize for Peace was awarded to Albert Gore and the IPCC for their work in promoting the theory that global warming was caused by green-house gasses, and that, based upon computer simulations, increasing amounts of these gasses in the atmosphere would cause runaway warming, with disastrous consequences for the planet. At the time, this appeared to be a plausible explanation for the warming, since CO2 levels in the atmosphere were clearly rising. However, for the past 15 years or so, there has been a “Pause” (no statistically significant warming) in the warming trend, leaving scientists around the world scratching their heads for an explanation, since this was not predicted by any of their models. However, it can be proven, from published data, that the observed warming was actually a “side effect” of the American Clean Air Acts (1963, 1979, 1990 ) and similar efforts abroad, and had nothing to do with greenhouse gasses..
Just as the global cooling caused by a large volcanic eruption ends after its stratospheric Sulfur Dioxide (SO2) aerosols have settled out of the atmosphere, warming will naturally occur when anthropogenic SO2 aerosols are likewise removed from the troposphere. As the Clean Air Act efforts were implemented, warming naturally occurred, as it was expected to, but the warming was wrongly attributed to greenhouse gas emissions rather than simply to the cleaner, more transparent air (fewer dimming SO2 aerosols to weaken the sun’s rays). The eruptions of Mt. Pinatubo and Mount Hudson (1991) injected 23 million tonnes of SO2 into the stratosphere, according to TOMS satellite measurements (plus other fine particulates which settled out within a few weeks), leaving a cloud of sulfate aerosols that circled the globe and persisted for about 2 years before finally settling out. Examination of the Goddard Institute for Space Studies (GISS) monthly temperature maps shows that global cooling, from the pre-eruption level, reached 0.45 deg. C. in November of 1992. As the pollution settled out, temperatures rose to pre-eruption levels, because of decreased dimming, an increase of 0.45 deg. C. from the nadir.This represents a temperature rise of approx. .020 deg. C. for each Megatonne of SO2 removed. “Strato-spheric SO2 aerosols reflect sunlight, reducing the amount of energy reaching the lower atmosphere and the Earth’s surface, cooling them”. Human-made sulfate aerosols “absorb no sunlight but they reflect it, thereby reducing the amount of sunlight reaching the Earth’s surface”. 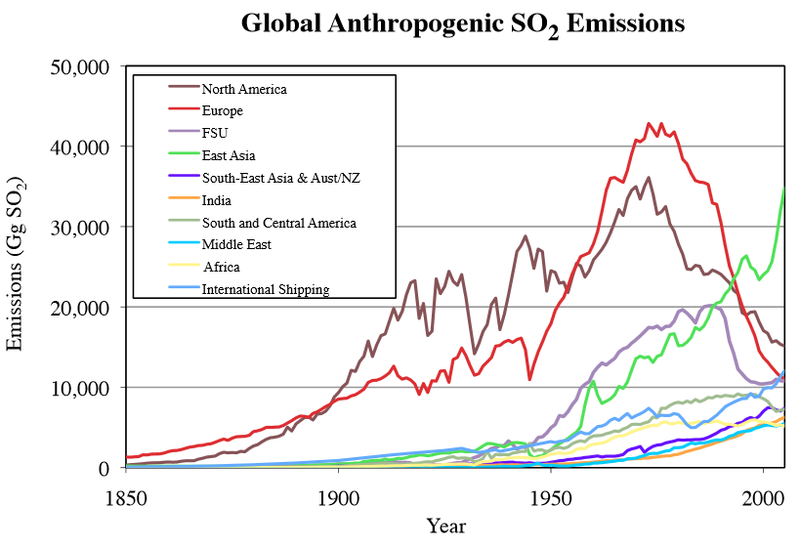 The changing levels of SO2 emissions around the world are nicely shown in the graph “Global Anthropogenic SO2 Emissions” in the paper “Anthropogenic Sulfur Dioxide Emissions:1850-2005” by S. J. Smith, et al. The graph was compiled from published data by Robert A. Rhode. 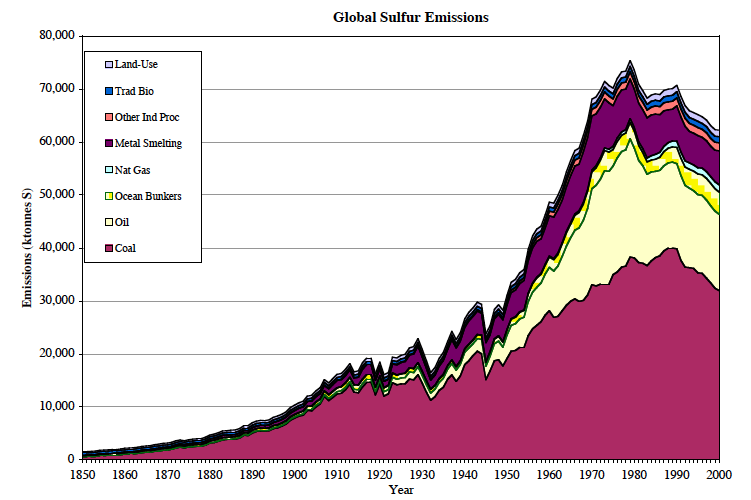 The 1972-1985 SO2 emission levels cited herein were extracted from that graph, and emissions from 1990-2011 were taken from “The last decade of global anthropogenic sulfur dioxide: 2000-2011 emissions”, Table S-1, by Z. Klimont, et al. Applying the “.020 deg. C. per Megatonne of SO2 removed” relationship to the net 25 Megatons of SO2 removed, 1972-2000, due to global Clean Air efforts, an average global temperature rise of 0.50 deg. C. would be expected. The NASA Global Land-Ocean Temperature Index GHCN-v3, shows a rise of 0.38 deg. C., (0.12 Deg. C. lower). However, this lower temperature rise was due to the effects of the strong 1998-2001 La Nina which depressed average global temperatures. Otherwise, both temperatures would have been nearly identical. In contrast, the models incorporating CO2 in the IPCC fourth assessment report (Figure SPM 5) projected an increase of 0.8-1.2 deg. C. for the same time period, much too high. Figure 2: Figure SPM.5. from IPCC AR4 Summary for Policy Makers. Left Panel: Global GHG emissions (in GtCO2-eq) in the absence of climate policies: six illustrative SRES marker scenarios (coloured lines) and the 80th percentile range of recent scenarios published since SRES (post-SRES) (gray shaded area). Dashed lines show the full range of post-SRES scenarios. The emissions include CO2, CH4, N2O and F-gases. 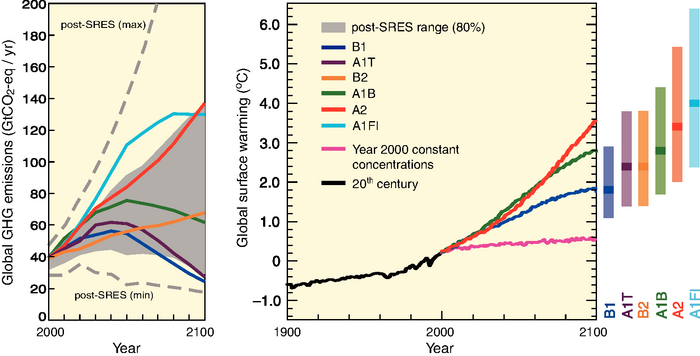 Right Panel: Solid lines are multi-model global averages of surface warming for scenarios A2, A1B and B1, shown as continuations of the 20th-century simulations. These projections also take into account emissions of short-lived GHGs and aerosols. The pink line is not a scenario, but is for Atmosphere-Ocean General Circulation Model (AOGCM) simulations where atmospheric concentrations are held constant at year 2000 values. The bars at the right of the figure indicate the best estimate (solid line within each bar) and the likely range assessed for the six SRES marker scenarios at 2090-2099. All temperatures are relative to the period 1980-1999. With respect to anthropogenic SO2 emissions from intermittent sources, they will generally settle out of the atmosphere within a few days. The conversion of SO2 to Sulfuric Acid (the SO2 aerosol) happens very quickly, so it acts as a dimming aerosol even in that short time. However, the bulk of anthropogenic SO2 emissions come from relatively constant sources such as power plants, factories, foundries, vehicle exhausts, home heating units, maritime shipping, and the like. The atmosphere is never free of their dimming aerosols since they are constantly being renewed. As such,.they have a much longer effective lifetime than aerosols injected into the stratosphere, ending only when the emitting sources are either modified to reduce emissions, or are shut down. The fact that an empirically-derived factor from the Mount Pinatubo eruption can be used to accurately predict the amount of temperature rise resulting from the removal of 25 Megatons of dimming anthropogenic SO2 aerosols due to Clean Air Act efforts is further proof that the climatic behavior of stratospheric and tropospheric SO2 aerosols is identical. The ultimate test of any hypothesis lies in its predictive ability. Above, it accurately predicted the amount of warming that would occur when a net of 25 Megatonnes of SO2 emissions were removed from the atmosphere. 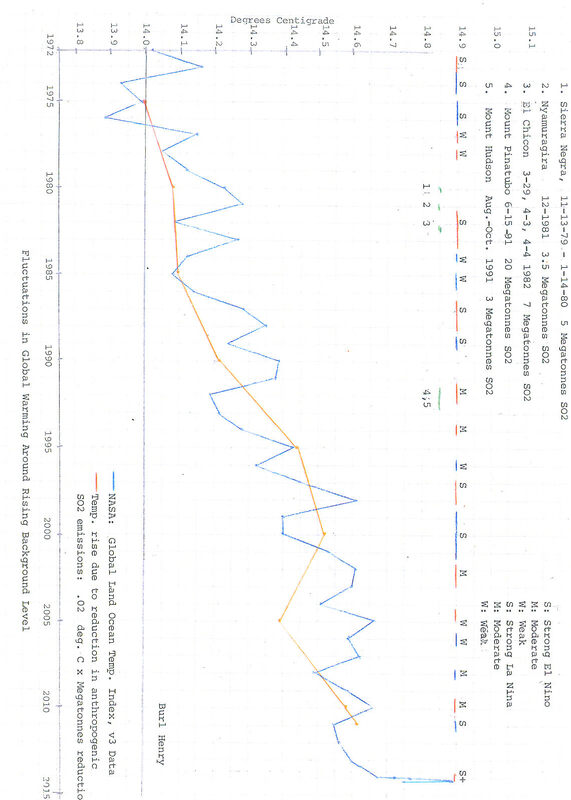 GISS values were essentially identical until about 2005, but NASA values have trended higher since then). The slightly higher-than-predicted temperature rise was due to the moderate 2009-2010 El Nino, which, in this case, temporarily raised global temperatures Without the El Nino warming, the actual and predicted temperatures would would have been essentially identical. This can be seen on the accompanying annotated graph of global temps. 1972-2011. The graph shows the “background” warming due to the removal of SO2 aerosols, and deviations above and below that line due to natural causes, such as El Niños, La Niñas, volcanic eruptions and (probably) non-eruptive SO2 ventings, such as currently coming from Baroarbunga, in Iceland. The graph also shows that the “pause” is caused by the near balance in the amounts of global increases and decreases of SO2 emissions since 2001. This balance, however, cannot be expected to continue, because of planned EPA actions, and efforts to reduce pollution in the Far East. During the 1930’s depression era, global anthropogenic SO2 levels decreased, largely due to reduced industrial activity Between 1930 and 1938, for example, they fell by approx. 29 Megatonnes (see the graph of Global Anthropogenic SO2 emissions cited above) Again, using the “.020 deg. C.” factor, an average global temperature rise of 0.58 deg. C. would be expected, NASA and GISS temp. values show a rise of only 0.30 deg. C, for that period, but, again, a strong La Nina (8th strongest in 115 years) in 1938 lowered the average global temperature. Without it, both values would have been much closer. The accuracy of the above three examples proves that the “.020 deg.C.temp. rise for each Megatonne of SO2 removed” relationship is basically correct (although some minor adjustment may need to be made as it is more closely examined). Conversely, an increase in the amount of SO2 in the atmosphere should cause a decrease in global temperatures. This happened, for example, in the 1960 -1972 period, when global levels of SO2 emissions rose from 93 Megatons to 131 Megatons, an increase of 38 Megatons. This was the period when there were concerns that a new Ice Age might be dawning, because of the lower temperatures being experienced. The phenomenon of global brightening, as detected by satellites, also mirrors the reduction in SO2 levels in the atmosphere, as would be expected. According to the Wikipedia article on Global Dimming the switch from a “global dimming” trend to a “global brightening” trend began around 1985, just as global SO2 emissions started to significently decline, and basically ended when the “pause” began, in 2000. Twenty-one of the 25 Megatonnes (84%) of net SO2 emission decreases, 1972-2000.were removed in the 1985-2000 period of global brightening, as well as 84% of the resultant temperature rise, 1972-2000. The “brightening” in the absence of any increased solar output, could only have been caused by ewer dimming aerosols, resulting in increased warming of the earth’s surface. Of the 131 Megatonnes of SO2 emissions present in the troposphere in 1972, a net global reduction of only about 29 Megatonnes occurred by 2010. This was sufficient to raise average global temperatures by about 0.60 deg. C, and is the primary cause of the California drought. It is unfortunate, but further actions to reduce SO2 emissions, especially by the EPA, and in Eastern Asia, can be expected to cause ever-increasing temperatures. Since CO2 has been shown to have no climatic effect, all efforts to reduce CO2 emissions in hopes of controlling global warming will be a waste of resources. “We thought we lived in a global warming world, but this is actually not right. We live in a global warming plus a global dimming world, and now we are taking out the global dimming. So we end up with a global warming world, which will be much worse than we thought, much hotter”. May 26, 2015 in Aerosols. If this SO2 theory is correct and lowers the temp as much as stated and as quickly we should be having temps well below those of the LIA looking at the first graph. As the world started to warm the SO2 went up which seems to fly against this theory. Burl, this is an interesting article. The idea of ‘global brightening’ is not new but it’s interesting to see some numbers. However, there are several flaws in your approach. This is not proof that the hypothesis is correct, it is called bias confirmation. Also “predicting” something which has already happened does not count as a test of your hypothesis. The bump in european and american emissions may roughly fit but you cannot close one eye and ignore China. Figure 1 lacks a plot of TOTAL emissions , which does not have the same form. Maybe you could add that for inspection. The other thing you need to take account of is concurrent natural variation. There was a general cooling that started in 1989, you are confounding this with the effects of Pinatubo. This will lead you to over-estimate the cooling effect and thus over rate you SO2 warming. In fact the peak in the stratospheric forcing peaked much earlier but the lag in the surface climate response occurred in mid 1992. What also needs to be examined is the warming that occurred after El Chichon and Mt P had settled. This was far more than just warming back up to pre-eruption levels. It appears that when natural processes flushed out the stratospheric volcanic aerosols they possibly also cleaned out a lot of built-up human pollution. There was also a significant change in stratosphic ozone, which was destroyed by the sulfuric acid aerosols. This is documented. It is likely that the effect of the tropospheric pollution ( and thus removal thereof ) is being significantly under-estimated. The following article also estimates a much stronger effect from volcanic aerosols that aligns with mainstream values derived in 1990 by Hansen’s team. That article does agree to some extent with global brightening which has certainly been helped by the west cleaning up our act on real pollution issues. This is all far too complex and interlinked to attribute one cause or another. That is the failing of the last 30 years of climatology. Actually, the gold speck here is that aerosols had a diminishing effect at the onset of the “CO2 Era” (1950) and a much lesser effect today. That strongly suggests that aerosols have increased the trend. That increase must be subtracted from the net of anthropogenic warming effect (CO2, soot, etc.). Yes, overall soot landfall was greater at the start of the CO2 era — but the actual effects are much greater towards the end of the series. That is because soot impacts had very little impact on Arctic ice/albedo until the Chinese industrial revolution (they were too far south to affect much), and Chinese development has occurred primarily at the end of the series (see the graph). So we have particulates cutting in one direction and one direction, only. Two spurious warming effects at the end of the series, and failure to account for this spuriously increases the amount of warming attributed to non-particulate effects, such as CO2. Someone isn’t getting invited to the next AGW party. I don’t see how those variations in SO2 could lead to changes in jetstream tracks and total global cloudiness. This is just another attempt to say that climate change is all our fault but using a different set of parameters. Don’t clouds form when cosmic rays collide with the atmosphere creating particulates from SO2, Ozone and water vapour? More SO2 might lead to more cloudiness via this process? More SO2 does lead to more clouds locally but shifting the jets from zonal to meridional thereby lengthening the lines of air mass mixing around the globe is another matter altogether. Cosmic rays are supposed to have an effect on cloudiness by providing more cloud condensation nuclei as per Svensmark but, again, shifting jet stream tracks is another matter altogether. I prefer the idea of solar induced changes in the tropopause height gradient between equator and poles. I wonder what the ‘forcing’ due to CO2 looks like after accounting for the SO2 emissions AND the adjustments made to the surface temperature record? 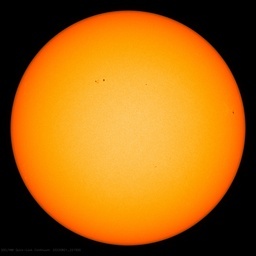 In essence though, if SO2 has been a major factor in explaining the global temperatures for the last 50 years, then it is the Sun which is the master control knob of climate and not CO2. That is what is proven here – nothing more and nothing less. No, the sun is a constant. The control knob is the amount of anthropogenic SO2 emissions in the troposphere. is name of the game. I believe you are correct, but it is hard for mankind to think it does not control everything, including climate. There is precisely zero actual physical evidence that humans have any detectable effect on global, as opposed to local, climate. I agree. But the question is how much and by what aegis. So far as I can see, the net effect is lukewarming at a rate of a third to half the projections of the CMIP3\5 models. The effect of aerosols is not the same in the stratosphere and troposphere. In the stratosphere, you are correct that it changes optical depth and cools. But in the troposphere, it is bothnoptical depth and cloud nucleation. Cloud nucleation predominates, since on aberage about 2/3 of the sky is cloudy. The resulting cloud feedback depends on the type and altitude of the resulting clouds. Cirrus warms. Low thick clouds net cool. Net cloud feedback is the biggest present uncertainty according to AR4 and AR5. IPCC thinks positive. I think roughly neutral or slightly negative. Since all anthropogenic SO2 emissions remain in the troposphere, you cannot use the derived Pinotubo stratosphere value to project the result of troposphere SO2 reductions. There seems to be general agreement these aerosols cool. But not about by how much; the recent Bjorn Stevens paper says by less than half the negative forcing of what AR5 said. Nevertheless, three examples were given where the derived Pinatubo value gave accurate temperature projections. No one has accurately predicted global temperatures. In fact, global warming stopped many years ago, and no one predicted that. The resulting cloud feedback depends on the type and altitude of the resulting clouds. Cirrus warms. Low thick clouds net cool. High altitude cirrus warm, but they do NOT warm any more than the same amount of water vapour would do if not condensed around nuclei. The only difference between SO2 being or not being there, is the water vapour condensing or not condensing. In any of the two cases, the warming due to greenhouse effect is the same, but if it condenses, it also reflects some incoming light and therefore cools. So SO2 effect is always one of cooling, no matter the altitude of the clouds it may generate. It can cool a lot, if it leads to low altitude clouds, or it can cool a bit, if it generates cirrus. Yes, it is always one of cooling. But if you remove Megatonnes of it, then warming naturally occurs, which is the point of my post. Yes, Burl. But if your theory is right, if you add Megatonnes of SO2, then cooling naturally occurs, which is the point you are ignoring as fast as you can. As I pointed out above, your theory about .02° per megatonne means the earth should have COOLED from 1850 to 1980, which was the point of my previous comment. Look, Burl, a lot of very smart folks have pointed out exactly where you’ve gone off the road. And so have I. You’ve ignored them, one and all, just as you’ve ignored me. Now, you seem to think that holding on to your theory and sticking your fingers in your ears and saying in essence “Na, na, na, I can’t hear any of you, na, na, na” gains you points. I’m here to tell you that is not the case. YOU ARE DESTROYING YOUR REPUTATION ENTIRELY BY NOT PAYING ATTENTION TO OBJECTIONS TO YOUR THEORY. Given what I’ve seen so far, you’ve placed yourself firmly on my own personal “SKIP HIS COMMENTS” list, and you’ll stay there until you demonstrate that you can admit when you have made a mistake. You’re free to do that, of course, and if you do I’ll change my mind. For now, perhaps you can at least start by trying to explain why the temperatures didn’t obey their SO2 masters from 1850 to 1980 on and warmed a degree or so instead of the 2°C cooling that your theory so confidently hindcasts … and why they changed, explain why in 1980 the temperatures realized the error of their ways and started obeying nobody but SO2. I await your explanation, and I fear that the size of your prediction (a 2°C cooling since 1850) will make that more than difficult. Another way to look at this… global SO2 levels are back to what they were in about 1965 (don’t have exact numbers). So the SO2 model is neutral in that period but temps are higher. Thus the SO2 model in no way shape or form negates carbon dioxide forcing. I have been making the same point for a year, but this provides better data than my back of the envelope analysis. There have been some sporadic attempts to address the SO2 issue, including the claim in “Superfreakonomics” (Levitt and Dubner) that adding SO2 to the stratosphere is the cheapest way to reduce global warming – which resulted in the authors apparently being banned from the discussion as heretics. It is nice to know that we have the answer, even though no one will listen – because they can’t make money off it, or take over the energy industry – and because they would have to admit that the $20 billion in research grants which funds the climate industry was wasted – and mostly because they would have to admit that global warming 1980-2000 was largely caused by the EPA. Thanks for the tectonic link, exactly what I found, temperature rise coincides with the increase of tectonic activity in the mid Atlantic ridge . All we need do to prevent runaway warming and keep the “ideal” temperature we have now is to re-open a few coal-fired power stations. Never thought it could be that simple. Some countries are already doing it. China will increase it, India will increase it. Wait for the Bank of China to get started and many countries in Africa will start planning and opening new coal-fired power stations. So the Romans burned too much coal and wood which caused the temp to drop around 150 AD, then as the population dropped less coal was burned and the climate improved again slowly starting around 700 peaking around 1100 and dropping again from about 1250/1300. The increased population must have been at it again. As the population fell once more due to failed harvests and sickness we burned less coal and wood. Clearing the air once more for the temp to increase from around 1850. And that is where the real SO2 theory disconnect starts. I think I agree with JimS in the meantime, solar energy does it again. Wow. I read about this theory many years ago (that our cleaner air was keeping us from going into an ice age) Would love to see more (a peer reviewed study?) – but I won’t hold my breath- as this will have to change the propaganda from warm is bad, to warm is good (who wants another ice age?) .. Have to start using photos of Mars instead of Venus in the photos, and Polar Bears taking over the planet… Interesting times to come. Polar bears from the north, penguins from the south. The battle of fur and feathers coming up. And poor us caught in the middle. “Though greenhouse gases are invariably at the center of discussions about global climate change, new NASA research suggests that much of the atmospheric warming observed in the Arctic since 1976 may be due to changes in tiny airborne particles called aerosols. Emitted by natural and human sources, aerosols can directly influence climate by reflecting or absorbing the sun’s radiation. The small particles also affect climate indirectly by seeding clouds and changing cloud properties, such as reflectivity. The researchers found that the mid and high latitudes are especially responsive to changes in the level of aerosols. Indeed, the model suggests aerosols likely account for 45 percent or more of the warming that has occurred in the Arctic during the last three decades. The results were published in the April issue of Nature Geoscience…. At the same time, black carbon emissions have steadily risen, largely because of increasing emissions from Asia. Black carbon — small, soot-like particles produced by industrial processes and the combustion of diesel and biofuels — absorb incoming solar radiation and have a strong warming influence on the atmosphere…. The regions of Earth that showed the strongest responses to aerosols in the model are the same regions that have witnessed the greatest real-world temperature increases since 1976. The Arctic region has seen its surface air temperatures increase by 1.5 C (2.7 F) since the mid-1970s. In the Antarctic, where aerosols play less of a role, the surface air temperature has increased about 0.35 C (0.6 F)…. The growing recognition that aerosols may play a larger climate role can have implications for policymakers. Excellent Post. I wonder why it never attracted more attention. As I always say, science doesn’t even know the sign of the net human effect on climate, but whether that is to warm or cool, either way, it’s negligible. There is zero physical evidence suggesting that amount of temperature raising. But even if warming to that negligible extent should actually happen, it would be a good thing and therefore nothing to worry about. Are you aware that the mean random fluctuation in GASTA (if such there be) from one century to the next is 1.0 degree C? Thus 0.6 degree for a century is not only negligible but statistically meaningless. You don’t seem to be aware of the fact that global warming stopped between 12 – 18 years ago, depending on your data source. Whatever you “think” is meaningless. Post verifiable facts, then we can discuss it. This is the central fallacy of the whole damned mess. There is no reason to fit a linear trend to climate and even less reason to ASSUME that it will continue at the same rate for some arbitrary projection into the future. This is totally a consequence of the initial ASSUMPTION that all long term change in climate can be attributed to AGW and that all natural variability will conveniently average out over whatever period we wish to look at. One thing we can be sure about is the ‘current trends’ WON’T continue. Then we need to start thinking. Volcanic activity worldwide. The rise in activity may coincide with co2 and so2 in the atmosphere. This is not counting undersea volcanic activity, which would greatly increase the signal. I don’t think these aerosols are a single “control knob” on the climate, as this article makes out, any more than CO2 is. Both of them are two of many significant factors at work in the chaotic climate. But it is good to point out the strength of the correlations here and ask for this factor to be given some respect. And if it is true as he says that the IPCC ignores the SO2 factor in its “graph of radiative forcings” than surely that is a big error. They don’t. They overstate it as a negative forcing, to ‘cool’ models whose hindcasts would otherwise run too hot. Has anyone continuously measured the sulfur emissions of each and every sub-aerial volcano on Earth for the last, say, 30 years? I doubt it. Then there are other emissions such as the hydrogen sulfide emitted from those nasty fossil fuel’ deposits – you only have to stand beside the La Brea tar pits near down-town Los Angeles to get a good whiff of ‘rotten egg’ gas. Ditto for the drive between Santa Paula and Ojai in Southern California. Then there is oxidizing pyrite, a not-so-rare mineral found in many sedimentary and volcanic rocks all over this planet. It’d be a good idea to measure background emanations from thousands of places on the Earth’s surface before going off half-cocked in a hubristic effort to single-handedly save the planet. Anthropogenic SO2 emissions are in the millions of tonnes. Those that you mention can be no more than a roundinng error. Cooling the planet by throwing more crap into the atmosphere. Who wudda thunk it. None of the climate models – not one of them – could match the change in mean global temperature over the past century if it did not utilise a unique value of assumed cooling from aerosols. So, inputting actual values of the cooling effect (such as the determination by Penner et al. Kerr  and S. E. Schwartz et al. (Quantifying climate change–too rosy a picture?, available at http://www.nature.com/reports/climatechange, 2007) recently pointed out the importance of understanding the answer to this question. Indeed, Kerr  referred to the present work and the current paper provides the ‘‘widely circulated analysis’’ referred to by Kerr . This report investigates the most probable explanation for such an agreement. It uses published results from a wide variety of model simulations to understand this apparent paradox between model climate responses for the 20th century, but diverse climate model sensitivity. Kiehl’s Figure 2 can be seen here. (b) each model is forced to agree with the rate of past warming by using a different value for “Aerosol forcing” that is in the range -1.42 W/m^2 to -0.60 W/m^2. The technique uses pyrheliometers to look at the sun on clear days. Measurements are made at air mass 5, 4, 3, and 2. The ratios 4/5, 3/4, and 2/3 are found and averaged. The number gives a relative measure of atmospheric transmission and is insensitive to water vapor amount, ozone, solar extraterrestrial irradiance changes, etc. It is also insensitive to any changes in the calibration of the instruments. The ratioing minimizes the spurious responses leaving only the responses to aerosols. I have data for about 30 locations worldwide going back to the turn of the century. Preliminary analysis shows no trend anywhere, except maybe Japan. There is no funding to do complete checks. So in summary Richard, I agree with your assessment. Runaway clean air will be the death of us all. One can conclude nothing else. Another feeble attempt to come up with a simple solution to a very complex system. In a word their explanation is ridiculous. This statement is completely false! Wow! That settles that, then. I’m glad you made that clear, although, maybe for those of us who don’t find it, as my math prof would say, “intuitively obvious”, you could elaborate? Yes, but wasted resources are only a part of the problem, rising energy costs are the worst part. I’d expect that reducing SO2 emissions in the west and increasing them in the east would have more effect than a butterfly flapping its wings. Like some of the contributors above, I also cannot reconcile the above theory with the temperature variations during recorded warm and cold periods pre industrialization such as roman warm period, Vikings settling in Greenland, Maunder minimum etc. During these swings in temperatures surely there was no SO2 variations involved. The theory would be strengthened if it could be shown that a natural variation in SO2 was happening (with an emissions budget) corresponding with these swings in temperatures during at least the last 1000 years. Exactly, and the same can be said for CO2. This hypothesis says nothing about earlier warming and cooling periods. It suggests rather that man-made SO2 had a small but detectable cooling effect during global industrialization prior to the enactment of clean air laws in the developed world (North America and Europe). The fall of the USSR and Warsaw Pact also probably led to cleaner air there. It argues further that since these regions cleaned up their air, the planet warmed slightly from this cause. The effect isn’t enough to override the natural cooling and warming cycles evinced by the Roman, Medieval and Modern Warm Periods and intervening cool intervals, such as the Dark Ages Cool Period and LIA, but it can account for much of the supposedly observed warming of the 1980s and ’90s. Put another way, if you’re looking for a tri-atomic compound in the air upon which to blame man-made climate change, look no farther than SO2, more significant, but still negligible, than CO2 going from 280 to 560 ppm. So, the answer to avoiding catastrophic climate change is… Pollution! Get out those SUV’s lads! Even better, Cadillac Broughams if you have them. Worldwide increase in demand for gas masks could be a problem, though. First, Buel, thank you for all of the interesting work. However, I would caution you in the strongest terms from making any facile assumptions about the relationship between SO2 and temperature. See e.g. Prediction is hard, especially of the future. Finally, per your references (which I thank you for providing) we are currently adding ~ 100 megatonnes of SO2 to the atmosphere annually, versus only a couple of MT in 1850. Since the SO2 stays in the atmosphere for something on the order of a year, we’d currently be running an excess airborne burden of on the order of 100 MTonnes of airborne SO2. PS: Using three decimals of significance, as in “.020 deg. C.”, is much more than the accuracy of the calculations will sustain. As I had stated, anthropogenic SO2 emissions in the troposphere peaked around 1972 at approx. 131 Megatonnes. Excellent agreement, when El Ninos, La Ninas and volcanic eruptions are factored in, is obtained using the .020 deg. C/Megatonne removed “rule of thumb”, as you say. Regardless of what happened in the 1850’s to now, currently the lowering of SO2 emissions is causing higher temperatures, and that must be our greatest concern. Higher temperatures are not a cause for concern, but to be welcomed and embraced. Why should higher temperatures be a concern? We should welcome them. Hummm… if the SO2 emissions peaked near 130 megatons in 1975, then applying your 0.02C per megaton suggests that in 1975 the Earth’s temperature was being depressed by 2.6C relative to what it would have been absent SO2 emissions. I don’t think that is plausible, unless sensitivity to aerosol forcing (and so climate sensitivity in general) is extremely high. Is that what you are suggesting? There are lots of reasons to think (see recent paper by Bjorn Stevens) the aerosol forcing is even lower than the IPCC suggests in AR5. 2.6C of cooling in 1975 from SO2 is just not very plausible. That result is preposterously implausible. There are so many things wrong with your assumptions that I scarcely know where to start. But how about the fact that human SO2 emissions are in the troposphere and major volcanic eruptions inject sulfur compounds into the stratosphere? It might be possible to prove such a case if it was true that there is no natural climate variability, but since there would appear to be such variability if the historical record is any guide, then I’m afraid this theory has the same insurmountable problem as that of AGW . . . as we don’t know what the climate would have been doing throughout the relevant period or what it will do in future . .
Nice theory but it doesn’t seem to fit the data. SO2 started dropping after 1970 but temperatures fell then rose again. Actually fits well. S emissions dropped from the late 1970s, not 1970. That’s when allegedly the late 20th century warming began. You need to study the graph that I provided. What you say is not true. Sorry, what’s not true? The graph I posted? As Sturgi says, it looks like falling SO2 from late 1970’s. Temps rose from 1910, then fell from about 1945 to 1970, then 30 years increase, then steady. – and the warming in the thirties actually lasted from around 1910 to after 1945, the correlation to the SO2 emission drop in the thirties is very weak. This is not true. SO2 emissions dropped by approx. 29 Megatonnes in the 1930’s, and temps. in North America/Europe flared as a result, even though the whole decade experiencd La Nina’s, which acted to lower average global temperatures. The higher temps. in the 1940’s were due to El Nino’s.. Skeptical of the numbers here. China has been increasing SO2 probably much faster than the rest of the world has been reducing it. The theory itself is based on a more logical premise (that of surface albedo), than the greenhouse theory, but I would need much more evidence to convince me that the 0.02C per megaton of SO2 is accurate. As I said, skeptical of the numbers. More likely to trust the SO2 measurements than the calculations of its affect on temperature, but that “trust” is still flakey. There are just too many sources of emission and measurements of the entire atmosphere, just too unreliable. Don’t know why that posted twice. Anyway, it’s the assertion that SO2 is 100% responsible for the exact change in observed global mean temperatures that the main cause for my skepticism. and the Freakeconomists will be proven right in yet another debate. “Save the planet, ban the EPA.” Do I have that about right? Unravelling the secrets of the climate system will forever remain a never ending story. How the IPCC ever thought it could get away with declaring that CO2 emitted by human activity causes catastrophic global warming and is the key driver of climate change, will go down in history as the greatest ever scientific failure. It confirms your findings I guess. There is certainly some correlation with SO2 output from coal burning and temperature fluctuations over the past 4o years or so. Whether “it can be proven, from published data, that the observed warming was actually a ‘side effect’ of the American Clean Air Acts” is something else again. Was that a global event? I had noticed that the introduction of clean air directives in various countries and the scrubbing of Coal Power Station emissions coincided with change from cooling (1940-1970) to warming at the end of the 20th century. Then the Chinese started building coal-fired power stations every week putting unscrubbed emissions into the atmosphere and the temperatures stopped rising. Indeeed, this is one of the many reasons given for the ‘pause’. We do know that aerosols have a significant effect on global temperatures, but not exactly by how much. In fact, different models use different ‘fudge factors’ for aerosol cooling in order to get their ‘hindcasts’ correct. One of the main drivers in sourcing thermal coal from Wyoming rather than the Virginian areas was the lower sulphur coals from the Thunder and Powder Basins. The rail freight cost more than offset the astronomical costs of retrofitting sulphur scrubbers. The “.02 deg. C. temp. change /Megaton of SO2 removed/added” factor seems to nicely quantify the effect of SO2 aerosols. In the time period 2000-2005 global anthropogenic aerosol emissions rose by 5.58 Megatonnes, causing a dip in the calculated “background” temperature level (see my graph) This caused a reported decrease in average global temperatures of .09 deg. C. Using .02 x 5.58 gives an expected 0.11 deg. C, temp. decrease–within .02 deg. C. of actuality..
Fair enough, I did read too quickly, but my main objection was to the word ‘proven’. Tropospheric SO2 has a short lifetime in the atmosphere (unlike SO2 in the stratosphere); the half life is on the order of a week or less. This time is far too short to allow mixing across the equator, so any cooling influence from tropospheric SO2 has to be confined mostly to the hemisphere where it is emitted. Nearly all SO2 current emissions (and more so in the past) take place in the northern hemisphere, so based on your global average effect of 0.02C per megaton, we would expect cooling of the northern hemisphere, where the effect of SO2 emissions would be strongest, and to be much LARGER than the 2.6C global average you suggest for 1970-1975. But that is not what we see. Measured warming has always been at least as great in the Northern hemisphere as in the southern, even when SO2 emissions were rising in the period of 1910 to 1940. Your suggested strong SO2 cooling should have dominated the vert weak GHG forcing in that period and caused marked cooling, especially in the northern hemisphere, but it didn’t. Several people have provided you with clear arguments why your tropospheric SO2 theory of cooling fails. You should listen to them. Your theory is contrary to clear observational evidence. As I had pointed out, tropospheric SO2 has a very long effective lifetime because it is constantly being removed, ending only when the emitting source is either modified or shut down. Your comments regarding lifetimes are only valid for intermittent sources. Removal of SO2 aerosols will naturally cause warming. My theory is not one of “tropospheric SO2 cooling” as you state. It is one of warming due to the removal of cooling SO2 aerosols, and IS based upon observational evidence. Sorry, but your arguments are, frankly, nuts. You are ignoring a wealth of long published work, and suggesting a level of climate sensitivity that even wild-eyed CAGW advocates don’t suggest. You should reconsider this silly argument. The quest for human importance continues. I had not thought of that one. My own observations are that Mexico City, Beijing and Shanghai on a bad day are not as bad as the horrible brown smog that used to occasionally settle on London, Los Angeles and New York in the 1970’s – the stuff that used to mildly “burn” your nostrils and throat. Burned the eyes too. It is one way that you actually see an improvement driven in part by environmental regulation. Of course rising gas prices also helped by pushing engineer to improve engine efficiency. I remember the group of engineers working on the acid rain project telling the climate people that there would be a step function in the temperatures as a result of the removal of SO2 and being told to go back and fix your washing machines or whatever it is that engineers do now. This was over half a century ago. I think it is time this arrogant and inept profession should be held to account for the unnecessary suffering and even deaths it has caused and also be reminded that human influence is tiny so the change will be sub degree level as should be the academic status of climate science. 2. The general cooling in 1989 was due to a strong La Nina (May 1988-May 1989) It was completely unrelated to the cooling from the Pinatubo/Hudson eruptions. 3. Note my annotated graph: Net SO2 emissions increased by 5.58 Megatonnes between 2000 and 2005, causing a dip in the calcuated “background” warming and a consequent dip of about 0.1 deg. C.in average global temperatures. This was between the temporary warming caused by the 2002-2003 and 2004-2005 El Ninos, and further exhibits the sensitivity of global temperatures to SO2 increases/decreases. Did anyone study the eruption of the volcano Tambora on the island of Sumbawa, Indonesia in April 1815 (the worst Vulcan eruption in human history) which led to the lost summer of 1816, a worldwide cooling of the climate, failed crops in many parts of the world,. The OTHER dioxide. The actually evil and poisonous one. Useful in sterilization. Measured ratios of H20,, CO2, and SO2 from volcanoes shows considerable variation, not only from different regions, but also from successive eruptions of the same volcano. Interesting work. Unfortunately it appears the third world seems to be picking up where we left off in emissions. This will complicate the interpretation going forward. This discussion was fascinating to read. THank you. Missing from all of this is any discussion of the southern hemisphere. CO2 is a well mixed gas. SO2, by contrast, falls out of the atmosphere quickly. So, most global dimming/brightness hypotheses can be easily tested by comparing reactions of northern and southern hemispheres. SO2 is mainly emitted in the north. Very little SO2 ever gets across the equator due to the Coriolis force inhibiting cross-equatorial flow. The southern hemis is mostly ocean with low SO2 emissions and minimal regulatory changes. I’m certainly not an expert in this, but I know enough to realize that you can’t do the math on this or come to conclusions without comparing the differential hemispheric responses. I would appreciate if people could add to this line of thinking. So the shady, high SO2 NH should be cooler than the sunnier, low SO2 SH. Yet Antarctic sea ice is growing. 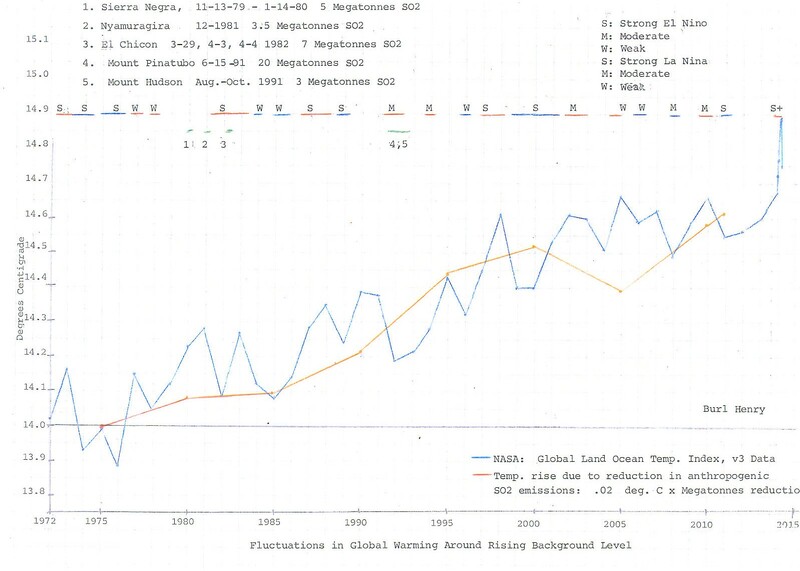 Examination of GISS temperature maps, especially for the 1930’s, shows what you are suggesting. Also for years without El Ninos. Are you aware that GISS constantly “adjusts” temperatures from the 1930’s to show non-existent warming? Nice GIF, hope you don’t mind that I’ve pinched it for later use. well if Buel Henry is correct, shouldn’t he be publishing this is a respected journal, rather than here? Who is Buel Henry anyway, no sign of him on google and what’s his/her qualifications? As Michal Mann said “We will keep them out – even if we have to redefine what the peer-reviewed literature is” – as he was inputting raw data instead of mean-centered data into a PCA program. Qualifications don’t matter. Only what he can support with evidence and analysis. Who cares who he is? would be, based solely upon how much SO2 was removed in the interim. From 1972 -2000, SO2 levels were continually decreasing because of Clean Air Efforts. But in the period 2000-2005, they increased by a reported 5.58 Megatonnes because of rising pollution in China. What would you predict would happen to average global temperatures? What actually happened was that average global temperatures dropped by 0.9 deg. C, the first drop in more than 25 years. Applying my .02 deg. C. temp. change/Megatonne of SO2 removed factor, a temperature decrease of 0.2 x 5.58 = 0.11 deg. C.would be expected. This is within .02 deg. C of actuality! No, Steve, my ideas are dead on. It is you, and other deniers, who have the problem. The latest data on global SO2 emissions that I had was only to 2011. Later data should be available in the near future. At that time, further confirmation (or rebuttal) of my thesis should be possible. Actually, my name is Burl Henry. The problem with publishig in a “respected” journal is that there are probably hundreds of peer reviewed climate-related articles relating to C02 and greenhouse gasses that are, based upon my analysis, completely wrong. Too few here have noticed the huge elephant in the tiny room! Using three decimals in any value regarding measurements in the atmosphere is pure fabrication! There is no such precision! Non scientific, just the way IPCC et al prefer … It’s just a plain simple delusional trick to make some work look better then it actually is. Even two decimals are too much, regarding how measurements are conducted. CO2, brightening and warming are all beneficial. Don’t sweat the small stuff. The problem is that projections predict the small stuff becoming much larger, and therefore worrisome. With no non-digital evidence, and equal plausibility! History, OTOH, is clear. Warming blooms the biosphere. No, I was not aware of the readjustments. Thank you for the post. However, it really doesn’t matter what temperatures are given to the excursions, since they are only temporary, due to El Ninas, La Ninas, and volcanic eruptions. What is important is their spatial placement and the “background” temperature (the temperature when there are no natural fluctations occurring). Burl, every alarming prediction about the climate has been wrong. No exceptions. You might consider that while you’re worrying. You will sleep better at night. A good point. But billions of dollars are being spent, and much hardship is being caused by that little warming–and if I am correct, the ‘science’ back of it is all wrong. I had to be away for a while and was unable to reply to most posts before I left. Here are some belated comments, which you may or may not see. First, some background on my thinking. My analysis initially was an attempt to understand why the warming that began circa 1970 plateaued around year 2000, even though CO2 levels continued to rise. One potential explanation was that the rise in temperatures was actually due to a different mechanism than the accumulaton of greenhouse gasses. For example, the climatic response to the Mount Pinatubo eruption (cooling, then recovery to pre-eruption levels as the injected aerosols settled out) suggested that the removal of anthropogenic SO2 aerosols due to Clean Air efforts could be the actual cause of the observed warming. The near simultaneous eruptions of Mt. Pinatubo and Mt. Hudson in 1991 injected 23 million tonnes of SO2 aerosols into the stratosphere, causing 0.45 deg. C. of global cooling (and the same amount of subsequent warming) as the aerosols settled out. This represented a temperature change of approx. 0.02 deg. C. for each Megatonne of SO2 aerosols added or removed from the atmosphere–and a Climate Sensitivity to the addition or removal SO2 aerosols of the same amount. To test my hypothesis, using published data, I determined the cumulative net amount of SO2 added or removed, 1972-2011, and, at various intervals, multiplied it by .020 to determine whether the calculated temperature matched the values reported by NASA and GISS. Somewhat to my surprise, they matched so closely that there was no possibility of any warming from any other source, thus eliminating greenhouse gasses as the cause of any warming. Not included in my essay, but mentioned several times in this thread, were the results for 2000-2005, when, for the first time in about 25 years, instead of falling, net emissions of anthropogenic SO2 aerosols rose by 5.584 Megatonnes due to increasing emissions from the Far East. This resulted in a decrease in average global temperatures of 0.09 deg. C. Using the 0.02 deg. C. factor, a temperature change of .02 x 5.584 = 0.11 deg. C. would be expected, only .02 deg. C. from actuality. I’ll have to look into it more, but the difference does not appear to be insurmountable. The cause of the rise is probably solar in origin, since CO2 levels were very low for most of the time (even if they had any effect) and SO2 emissions were not being reduced.